Large easy-grip handle so you can take control. Firm nylon bristles are strong and resilient. 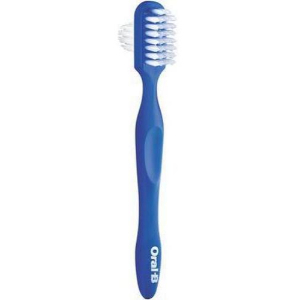 A large multi-tufted brushhead helps remove food particles and stains easily. A smaller angle-trimmed brushhead for hard-to-reach surfaces. Dentures require daily brushing for freshness and effective stain removal because effervescent cleansers alone cannot remove all food particles and stains. Helps you get a more thorough clean. Thumb grips on the handle allow for better control.